Dave you tried to tell me 3 months ago that even though prior to the updates I had no problems that the problem was suddenly I wasn't entering the info in the CDU correctly. If you going to refer to something I said to you three months ago, then please provide a link. I deal with hundreds of people a month, and 50 to 100 post a day, and my memory isn't that good. That said, I would find it ENORMOUSLY surprising that I would have said something the way you are reporting it. So provide a link please. Worked with 1.2.0.0 but with the next update suddenly I am a moron that can't enter the info. My trouble has no consistent trend other than it happens 99% of the time in all models. That my friend, is repeatable, thus it is consistent, at least given the number of variables at play here. I should fly the same flight over again like a beta tester to try and reproduce the bug. Sure, if you want to. Do you know anything about software beta testing, been involved in other products, or are type rated on the Airbus? If so, maybe we could talk. Otherwise, what I said in my reply you was to do whatever you wanted... report, not report, provide information, not provide information, you're call my friend. Frankly, I'm still greatly confused at what anything you wrote above has to do with the issue at hand, or really any issue. Forgive me though, it's Thursday here and I might not be firing on all cylinders - at least not until Friday. No, I don't enjoy the hobby so I can be a beta tester. Sorry, doesn't sounds like a good match to me. Still wondering thought that this has to do with anything. Because Many customers and Beta testers have not experienced this issue" it makes it up to me and others that have to be the Beta testers for Aerosoft? Honestly? You might want to re-read and reconsider that statement. The answer (as if it wasn't already common sense) is.... YES! If you have a real issue with any software on the planet.. and the developer doesn't see it on there test machines and their Beta Testers doesn't see it, then the only way to resolve it is by providing additional information to the developer. I'm sorry for this answer (provided to you before), but I have over 30 years in technical program management for multi-billion dollar systems, and it's done the same where there too. Just don't blame me for being the messenger.... it's the way the software development field words world-wide. If you don't like it, there is nothing that anyone at any company can do. Howling at the moon will not help either my friend. Best to learn how things work, and then if you don't like them, get involved and help make them better! You beta test for other developers. You obviously enjoy it so the rest of us should too I guess only we get to pay for the opportunity. Like the test of your statements... you attack things you don't understand and people you know nothing about. I think you're just frustrated and angry. While I don't understand how anything you wrote is even remotely relevant to the discussion, I can understand you being frustrated - but if that is the case you should just say so instead of criticizing things you don't remotely understand and taking it out on people you don't know and how have only tried to help you. So here is the deal... calm down, post responsibly, and stop taking your frustration out on others. So we are clear, the type of behavior you've exhibited thus far neither paints a good picture of you or your knowledge of flight sim development from a customers perspective. And for goodness sake, listen to people! I tried to explain what came across as your main gripe, and I think I did so in a very friendly and professional way and your reply just didn't reach the same level. You know, most everyone uses private message for this type of thing, and in your case it would have worked out better for you if you had. But I'm happy to do this publicly if you really want. I'll even give you your own thread if you'd like. You truly do have my best wishes. We understand your frustration and trust me we want to get this issue fixed as one of our top priorities. We want you to enjoy the product to its full potential and work hard to ensure that. The problem is that we are unable to reproduce this issue consistently within our beta team. Surely they get the product for free and are expected to test the product before releases in which they do a great job in. There are many things discovered daily in which the beta team helps immensely to troubleshoot and investigate. However, the team has limitations as well. Biggest of them all is the size. What this means is that due to the limited size our resources are limited with this kind of issues which we are unable to recreate consistently. That is the reason why we are looking for public help from any users that are willing to help us. If you are able to consistently reproduce the issue, then it's a huge help for us since we could take a look why it's consistently happening on your system while on other systems it might not be so consistent. In this investigation process, any information helps, especially log files or saved flight file few minutes before the issue occurs. Anyways, thanks for the report that you still get the issue with 1.2.3.0. We are still investigating it, and appreciate any help given by the customers to help narrow down the cause. Lets keep this thread on topic again. If you want, you can contact me personally on PMs to talk it out. Thanks. Its on the first page. "There are a number of things added, and I'd have to pull up the Step by Step in our Documentation and then compare it to the old Checklist to give you a comparison. The best thing to do is perform the Step-by-Step and I promise the new items will jump right out at you! " Completed 2nd flight (3.5 hr ) with no managed speed issues. v1.2.3.0. I'll keep flying and logging. Will report if I have an issue. I have waited quietly in the wings in anticipation of the new "full" version. I removed both of the full installs (A318/319) & (A320.321). I also removed all folders in "My Documents" that had anything to do with Aerosoft. I then purged all remnants using CCleaner followed by a defrag. A reboot was completed. I then installed the new versions and rebooted. I then updated my Navigraph. Today I tried my first flight with the A319. A plan was created in Australia YPDNYPTN14 with SID LAKUP4 and a ILS-Y OM14 approach. The level was FL190. The departure had an altitude restriction A3000 and B5000 at different waypoints along with a 600 foot intersection turn after takeoff. A bit of a task. After take off the AP was turned on just before the A600 waypoint. The copilot and flight system worked flawlessly. I watched with hands off and the plane climbed to 5000 and stayed there until it passed the ALT restriction. Just after passing the plane started to climb to 10000. It levelled off a bit at 10000 and allowed the speed to reach 300 then began a feisty ascent to FL190. At TOD it started to descend and also reduced speed to ~280 (had to add some speed brakes here). After ILS Loc captured I still got the wing wave after a bit. Close to GS I enabled App. The plane flew in like a happy bird with no wing wave near the airport. So far so good....more to come later. Ok. Good news! First flight without managed speed issues. Roughly 2 hour flight. All constraints were met (both speed and altitude). Keep in mind, this issue was not random for me - this happened every single flight. So the fact that I just completed a flight without issues is a great sign for me. Obviously a lot more testing to do, but a good start. I'll keep reporting. Thanks for your reports. Clearly the issue is still present with version 1.2.3.0 and we are still working on it to find out what is causing this behaviour. I cannot stress enough that you enable Alt process feature from the Airbus Configurator and send it either on this thread or to me via PM. It will log specific data regarding this issue and will help us to narrow down the possible causes. Also, if you can get a saved flight file before just before the issue happens (through autosave for example) it would be greatly appreciated if you could send that to me as well so I can try to recreate the issue with that file directly. This is my 3rd flight using 1.2.3.0 and it happened while I was climbing. Please enable logging an Post the log file. Please enable logging and post the log file. Okay, I will..where can I find the log file afterwards? You can enable logging through the configurator. It's especially the Alt process logging that we are interested in with this particular issue. Thanks. I will keep logging enabled and will share here once I encounter it again. Affirm, it will log the event when managed speed commands a speed below the trigger point. Weather was CAVOK with no external weather engine. I did use my multiplayer JoinFS (simconnect) and my ACARS (FSUIPC) with flight saves every 30 minutes. I had full logging turned on. The SID contained a speed restriction while the STAR had both BxxxxAxxxx and specific altitudes. It also had a speed restriction at one STAR waypoint. This seemed to have everything in it that had not worked in previous versions. In full managed mode for the entire flight every speed restriction was met as were all of the altitudes. It is hard to complain when everything seems to be working. My next flight will use manual restrictions for speed and altitude to see if there is a difference between Navigraph generated characteristics and manually entered ones. One thing that I continue to see is the MCDU showing an altitude that does not match the one that is being flown. 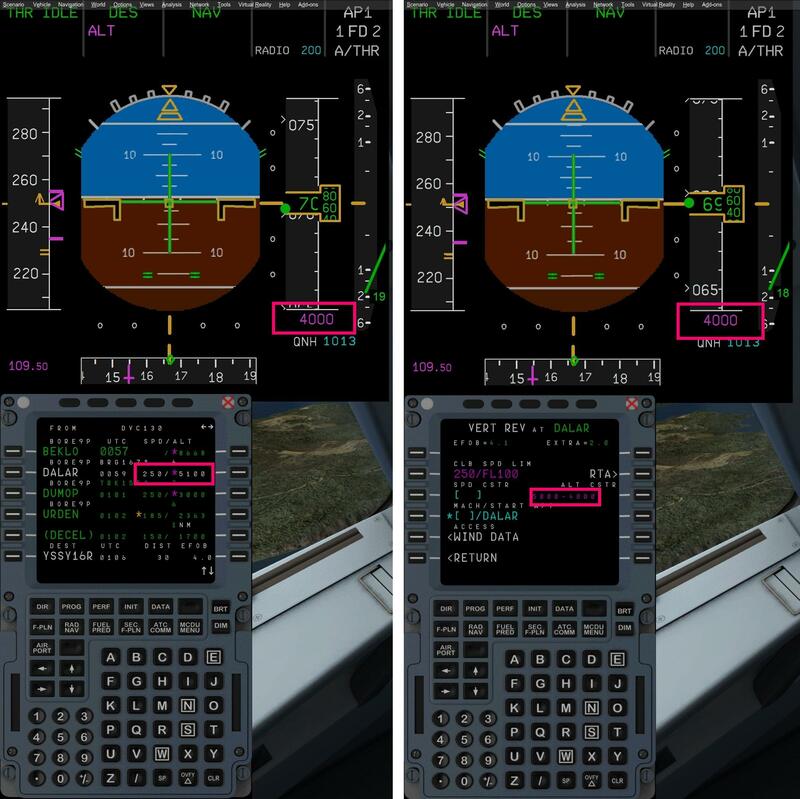 Image attached showing two mcdu views for the same waypoint. Ok, so first test flight for me after doing clean install of 1.2.3.0, and I, too, am still seeing the issue. Only Addon (other than OrbX scenery) was ActiveSky was running, in live weather mode. The flight started out ok, taking off from Rwy 6, flying runway heading. The STAR includes flying runway heading, then VECTORS to first waypoint, SLI. The SLI waypoint doesn't have a speed restriction, but does have altitude restriction of 4000A. The MCDU showed 250/4000A for that waypoint. After climbing through 1500 feet, raising gear, and retracting flaps (used flaps 1 T/O), I reduced throttle lever to Climb detent, as indicated on PFD. I then manually turned heading to the right to line up with SLI, after which I entered a DTC to command in the MCDU for that waypoint. As soon as I did that and was heading towards SLI, I then pushed the altitude selector to enter managed climb mode. That is when the trouble began! Even though the MCDU CLB page showed a managed speed of 289/.78 after that point, as soon as I pushed the altitude selector, the throttle commanded a speed of 189, as seen on the magenta indications on the PFD. It stayed at that speed. I tried disconnecting and reconnecting both autopilot and auto-throttle, but no luck. I also tried going into OP CLB mode, and then back to managed, but it still wouldn't command any higher than 189. 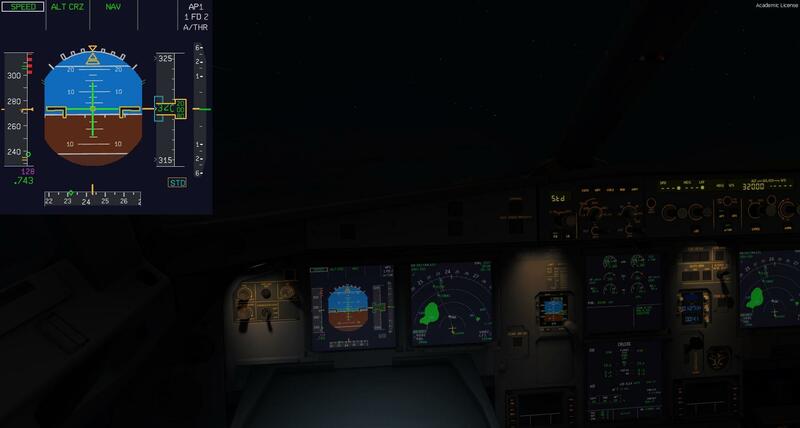 At that point I manually entered speed mode until reaching cruise at FL330. Once I was established in cruise, I decided to try managed mode one more time to see what would happen. I pushed the speed selector to enter managed speed mode, and as soon as I did...boom! Magenta command speed down to 139 knots on the PFD. The auto-throttle seemed very content following that, so I had to go back into manual speed mode to avoid a stall. One interesting thing I did note, is that after completing MCDU programming on the ground, before engine starting, the DES page showed a managed speed of .78/296; that 296 makes much more sense than the 188 it was showing at cruise altitude! When I tried to enter managed descent it indeed wanted to command the speed of 188 indicated. This was from the TOD at FL330. It's almost as if it totally ignored the MACH speed, and only wanted to follow the speed in knots. The rest of the descent until landing and shutdown as managed manually. I've included a few photos as well as my AltProcess.log file, hopefully this can help get to the bottom of the issue, and if there's anything else I can do to help you to that end, please let me know. Hi, the constraint is 4000-5000. On PFD the 4000 is the lower border for DES. The aircraft will not go below that alt. That is correct. In F-PLN you have 5100. this additional 100 is a known bug. But the aircraft will fly at 5000 according to PFD. Now getting back after my manually entered constraints. Each of the first four departure waypoints were given different altitudes and speeds. AP was engaged before 64LOC. All speeds and altitudes were maintained. This is something that I had yet to see with the new bus. The ND markers also seemed to match the plan. I will now have a look at injecting weather to see if that has any effect. Just had the speed drop to green dot speed while at cruise; i actually got through the climb phase without any issues. At this point, I'd like to know if Aerosoft has a mechanism to offer refunds? From a customers' perspective, I've been more than patient for this issue to to be solved. I've wasted enough time reinstalling this product; in short, I no longer have any faith in your ability to diagnosis and fix this problem. I'm incredibly disappointed with this purchase; my money could have been better spent on an alternative product capable of simulating a proper A/T. Perhaps it's time to contract an outside programmer capable of fixing this issue? I apologize for coming into your house and authoring an inflammatory message; yet, I expected better from Aerosoft! Either loosing speed during climb or at cruise, today I got about an hour and a half into my flight and the speed dropped. Manual control rest of way.